Comprehensive review of Neostrata Exuviance Super Retinol Concentrate. See how this retinol cream compares against other wrinkle creams! 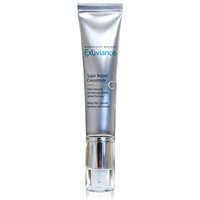 Overall I didn’t care for Neostrata Exuviance Super Retinol Concentrate! My skin got significantly worse while using this cream. It’s common for retinol products to dry your skin out in order to allow it to peel and resurface, however that NEVER happened with this one. My skin just kept getting worse and worse while I was using it. My makeup would no longer go on and my lines were more visible than ever before. My face started to breakout with acne and my skin became so dry that even hydrating oil would cause it to burn. I kept waiting for the “AH HA” moment with this cream, where I would wake up in the morning and notice a change to my skin, but that never happened. I was excepting so much more from a $78.00 product! This product is a beige-colored, lightweight lotion. It has the texture more of a lotion than a cream. When it first hits your skin, it has a silky smooth feel to it, which I liked. Applying Neostrata Exuviance was really quite simple. I would apply a thin layer to my face and neck before bedtime. I used the cream nightly. There is no special trick associated with this product; you would apply as you would any other typical face lotion. Neostrata Exuviance dries super quickly. It absorbs fast and never feels gooey on your face. After about 30 seconds, you can no longer tell that you just applied something which I love! This product doesn’t have a powerful smell. When you first pump it out, it almost appears odorless. However, once you apply it to your skin, you will start to notice a slight fragrance. It’s not one of my favorite scents that’s for sure, but it dissipates within a minute so it’s not a big deal. The next morning after using this cream, I didn’t really see much of a change. There was no redness or irritation which was good and my skin had the same texture to it. Longer term I did notice negative side effects. As time went on, the appearance of my skin got significantly worse. I started to break out on my forehead and chin and my makeup would no longer go on right. My skin became so dry and irritated that even pure hydrating oil would burn to apply. My lines and wrinkles were actually MORE apparent because of what this was doing to my skin. This cream contains 1% retinol, which is an above average amount for an over the counter product. Everything else in it is pretty standard for a retinol cream. This product is above average in comparison. $78.00 for an over the counter retinol treatment is on the high-end for sure! I would really have to love a cream to pay that amount and this product certainly was not worth it! Neostrata offers a satisfaction guarantee. A full refund is given if the product is returned 30 days from the purchase date. To Buy Neostrata Exuviance Super Retinol Concentrate, click here. Texture/Feel This is a light weight lotion that feels more like a lotion than a cream. Application I would apply a thin layer to my face and neck before bedtime. Drying Time Neostrata Exuviance dries super quickly… about 30 seconds. Smell Slight fragrance that dissipates within a minute or so. Short Term Results The morning after use I didn’t really see much of a change to my skin. Guarantee Yes, a full refund is given if the product is returned 30 days from the purchase date. Price $78 for 1 oz… high-end for sure!